All six countries within the GCC have plans to include renewable energy power generation in their energy mix for various reasons including: a growing demand for electricity because of increasing populations, an increasing government fiscal deficit due to inefficient subsidies, the need to diversify the economy and global pressure to meet climate change requirements. However, the decision of when and by how much to introduce renewable energy is fraught with complications. In this book, a stellar cast of regional policy and academic experts explore the reasons behind these renewable energy plans and the potential impediments to success, whether it be the declining cost of producing energy from hydrocarbons, an infrastructure which needs to be updated, social acceptance, lack of financing and even harsh weather. Weighing up all these factors, the book considers the route forward for renewable energy in the Gulf region. 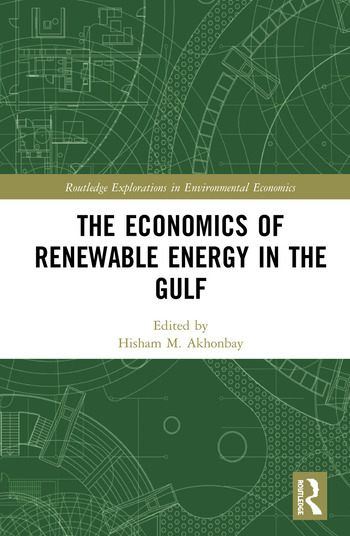 The Economics of Renewable Energy in the Gulf offers an excellent examination of the adoption of renewable energy in the area. It will be of great interest to academic researchers and policy makers alike, particularly those working in the areas of energy economics, public policy and international relations. Hisham M. Akhonbay is a research fellow in the Policy and Decision Science program at KAPSARC, Saudi Arabia. Working on GCC energy cooperation and research, he has been with KAPSARC since its inception. He was previously with the Center for Strategic and International Studies (CSIS) in Washington DC as a visiting fellow where he worked on the geopolitics of oil and authored a paper on Saudi Arabia’s energy policy.